There are 9 State Wildlife Areas in the GHA encompassing more than 25,000 acres of high quality hunting, trapping and wildlife watching opportunities. These properties host an array of grassland, wetland and wooded habitats that are popular destinations for deer, turkey, pheasant, duck and small game hunting. 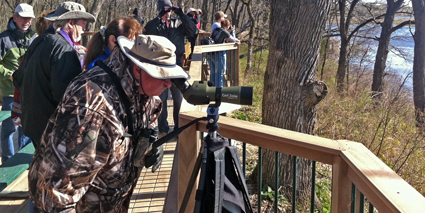 They also offer exceptional bird-watching during the spring and fall migrations. These areas will be expanded to protect and restore native habitat and offer public hunting, trapping and other rustic outdoor recreation options. There are 18 State Natural Areas in the GHA which represent outstanding examples of Wisconsin's native landscape of natural communities, significant geological formations, and archeological sites. These are a valuable for research and educational use, the preservation of genetic and biological diversity, and for providing benchmarks for determining the impact of use on managed lands. One new property, the Crawfish Prairie Habitat Area will provide critically needed habitat for grassland birds and other related species and two State Natural Areas will be expanded.